The Rockport Film Review: "TRICK 'R TREAT" Let the Party Begin! "TRICK 'R TREAT" Let the Party Begin! When John Carpenter’s milestone horror film “Halloween” came out in 1978, it changed movies forever. Now every holiday has at least one horror movie made in its honor, from “Mother’s Day”, “Thanks Killing”, and numerous Santa Slashers. 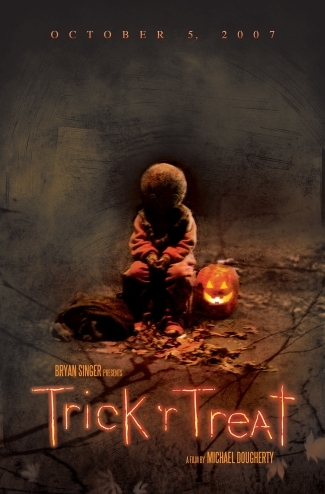 Usually, these movies were pretty bad, but Michael Dougherty’s 2007 film “Trick ‘r Treat” is a fun, scary, and enjoyable movie that is rarely made anymore. It’s actually quite amazing that it was even released at all. It was shelved by Warner Brothers for over two years because of “questionable content” and other studio related politics. The way that it is made and in the context of the material it is a crime that it took so long to come out. It just became available on DVD and Blu-Ray last October. 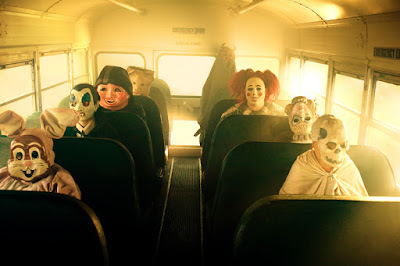 Trick ‘r Treat is like an old comic book as displayed in the opening credits. It weaves together five scary stories on your average Halloween night. Each story focuses on how people of different ages experience the holiday. A great cast was assembled to bring these stories to life. Anna Paquin, Brian Cox, Dylan Baker & Leslie Bibb all have fun roles and give great performances. Also appearing throughout the movie is “Sam” a seemingly little kid dressed up as a pumpkin who symbolize the terror and frightfulness of Halloween. Almost like a grim reaper, he makes sure all of the holiday rituals are followed and punishes those who don’t play along. Some of the reasons this movie took so long to be released is that a number of kids that are offed. A busload of special needs kids is purposely driven off a cliff and an elementary school principal moonlights as a serial killer. All of the Halloween stories and myths about the holiday really seem to ring true. Like “A Christmas Story” this is a movie that you can watch over and over every year. It’s well written, well made and just a heck of a lot of fun.